Our veterinary hospital is one of the first animal clinics in the region to add the use of therapeutic laser (also known as the cold laser). Our therapeutic laser can dramatically reduce pain, thereby reducing or eliminating the amount of medication needed to control it. These soothing, pain-free treatments send light deep beneath the surface to affect damaged cells. 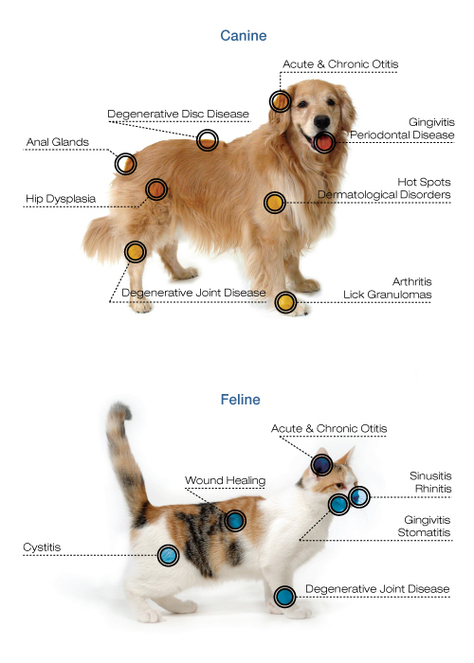 In addition to reducing the pain, this therapy also reduces inflammation and swelling, and speeds healing for numerous conditions including arthritis, hip dysplasia, back problems, ear infections, fractures and wounds.